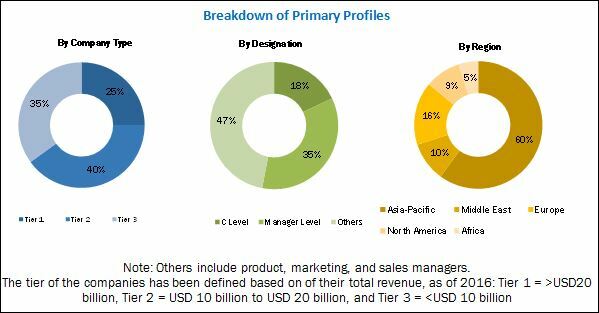 [150 Pages Report] The global molded case circuit breakers market was valued at USD 6.52 Billion in 2015, and is expected to grow at a CAGR of 6.82% from 2016 to 2021. Increasing manufacturing and infrastructural activities in Southeast Asia, increasing rural electrification, growing urban energy conservation programs, increasing industrialization and demand from utilities, revival in construction activities in the developing countries like India and China led by various government initiatives will trigger the molded case circuit breakers market. 2015 has been considered as the base year for company profiles. Whenever information was unavailable for the base year, the prior year has been considered. To analyze competitive developments such as contracts & agreements, mergers & acquisitions, new product developments, and expansions in the molded case circuit breakers market. This research study involved the use of extensive secondary sources, directories, and databases such as Hoovers, Bloomberg Businessweek, Factiva, and OneSource to identify and collect information useful for a technical, market-oriented, and commercial study of the global molded case circuit breakers market. Primary sources are mainly industry experts from core and related industries, preferred suppliers, manufacturers, distributors, service providers, technology developers, standard and certification organizations of companies, and organizations related to all the segments of this industry’s value chain. The points given below explain the research methodology. Study of growth strategies related to MCB and MCCB by key players across different regions from 2012 to 2016. After arriving at the overall market size, the total market has been split into several segments(By Type, By Rated Current, By End-User and By Region) and subsegments. The figure given below illustrates the breakdown of primaries conducted during the research study on the basis of company type, designation, and region. The MCB and MCCB ecosystem comprises of power and automation technology companies such as ABB Ltd. (Switzerland), Schneider Electric (France), Fuji Electric Co., Ltd. (Japan), Legrand (France), Hitachi, Ltd. (Japan), Rockwell Automation, Inc. (U.S.), among others; industry and energy companies such as WEG (Brazil), Chint Group (China) among others; manufacturing and engineering companies such as Siemens AG (Germany), General Electric (U.S.), among others; power management companies such as Eaton Corporation Plc. (Ireland), Huayi Electric Co., Ltd. (China), Noark Electric (China) among others who integrate the MCB and MCCB and sell them to end users like manufacturing and process industries, infrastructure sector and so on to cater their unique business requirements. Competitive Benchmarking of 25 players with respect to Product offering and Business strategy. The global molded case circuit breakers market is projected to grow at a CAGR of 6.82% from 2016 to 2021, to reach a market size of USD 9.62 Billion by 2021. This growth is attributed to the increasing infrastructural activities including commercial buildings such as airports, hospitals, and railway stations, increasing rural electrification and growing urban energy conservation programs, and increasing industrialization and demand from utilities. The report segments the molded case circuit breakers market on the basis of type into MCB and MCCB. The MCCB segment is projected to dominate the MCB and MCCB market. The molded case circuit breakers market has been segmented based on rated current ranging from 0A–20A, 21A–75A, 76A–250A, 251A–800A, and above 800A. The segment ranging from 75A–250A accounted for the largest market share in 2015. These MCB and MCCB are being increasingly adopted due to their wide application in various industries for motor protection, lighting duties, etc. The report segments the molded case circuit breakers market based on end-user segment into transmission & distribution, infrastructure (residential and commercial), manufacturing and process industry, transportation (railways), and others. The T&D industry segment is expected to grow at the fastest rate during the forecast period. MCBs are applied mainly in residential buildings and to some extent in the panel distribution system. As far as MCCBs are concerned, they are applicable in the LT distribution panels in the commercial buildings. The growing T&D sector, especially in Asia-Pacific region will likely drive the overall molded case circuit breakers market during the forecast period. In this report, the molded case circuit breakers market has been analyzed with respect to five regions, namely, North America, Europe, Asia-Pacific, Latin America, the Middle East & Africa. Asia-Pacific is expected to dominate the global molded case circuit breakers market during the forecast period, owing to the extensive use of these devices in manufacturing industries as well as infrastructural activities. The Asia-Pacific market is projected to grow at the highest CAGR from 2016 to 2021. The region is the largest market for the construction sector. The growth of the manufacturing sector, especially in Southeast Asian countries, coupled with an increase in power generation capacity in India, is expected to drive the molded case circuit breakers market in the region. 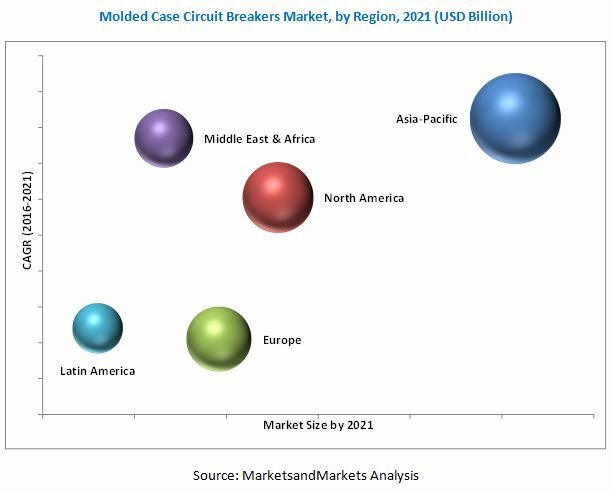 Increasing fragmentation in the manufacturing of MCB and MCCB could be a restraint of the molded case circuit breakers market, leading to declining profits. Additionally, MCB and MCCB form an important part of the mining sector; its slowdown has hindered the growth of the molded case circuit breakers market. Leading players in the molded case circuit breakers market include Siemens AG (Germany), Schneider Electric (France), General Electric (U.S.), Eaton Corporation Plc. (Ireland), Rockwell Automation, Inc. (U.S.). New product development was the strategy most commonly adopted by the top players, constituting 44% of the total developments from 2012 to 2016. It was followed by contracts & agreements, expansions, and mergers & acquisitions. 11.8 Fuji Electric Co., Ltd.
11.9 Huayi Electric Co., Ltd.